Design created for games, repeats, sport bar, pub’s… winner TEAM! Size: 4×6 inch bleed area. 300 dpi Fully layered and edit text Font .. Perfect tailgate theme flyer template! Football season is a breathe away. Tailgate parties are coming along with it. Template comes fully .. Poker Night Bar Flyer Template is suitable for bar poker night and with some modifications on text you can use it to advertise your poker .. 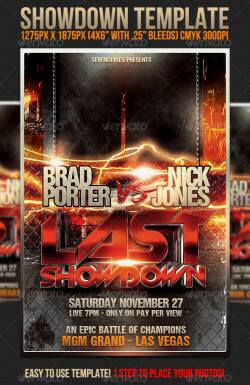 This flyer template is perfect for any MMA or Boxing match event. It can also be used for a UFC fight party. All you need to do is add your ..